Place beans, chicken broth, and half of the onions in a large pot, and bring to a boil. Reduce heat and simmer. Heat a large skillet over medium-high heat. Add oil. When oil is hot but not smoking, add onions. Sauté until tender. Add chicken and sauté for 5 minutes, stirring frequently until thoroughly cooked. Add green chilies, garlic, cumin, oregano, and red pepper flakes; stir well until combined. Transfer mixture to large pot and season with salt and pepper. Return to a boil. Reduce heat and simmer for 1 hour, or until flavors are well blended. Add more water or stock as needed. Serve warm, garnished with sour cream, cheddar cheese, and salsa. Fall is my favorite time of year and my favorite things to eat during the fall is cheesecake. I'm not sure if it's because it's just to heavy for the summer (unless it's key lime) or what but when I think of cheesecake I think of fall. And today I bought a spring foam pan so I can finally make some cheesecake and I thought I'd share with you the all the cheesecake I'm going to make and bring you pieces of because there is NO way I can eat it all myself=)Sorry I don't have a picture of the first one=) Well happy looking! 1. Position two oven racks, one above the other, bottom rack in lowest position. On bottom rack place a 13x9x2-inch baking pan and pour in water to 1-inch depth. Heat oven to 350 degrees F. To drain pumpkin, line a fine mesh sieve with 100 percent cotton cheesecloth or paper coffee filter; seat over a bowl. Spoon in pumpkin; set aside while preparing crust. 2. For crust, in bowl stir together crushed gingersnaps, butter, and the 2 tablespoons brown sugar. Press crumb mixture onto bottom and about 1 inch up sides of 9x3-inch springform pan. Bake 5 minutes or until firm. Cool completely on rack. 3. For filling, in large bowl beat cream cheese and the 1-1/4 cups brown sugar with electric mixer on medium speed until smooth. Beat in pumpkin (discard liquid), flour, and pumpkin pie spice until combined. Stir in eggs by hand. 5. Cool in pan on wire rack 15 minutes. With small sharp knife, loosen crust from sides of pan; cool 30 minutes. Remover sides of pan; cool completely on rack. Cover and chill at least 4 hours before serving. Serve with Cranberry Topping. Makes 14 servings. Cranberry Topping: In small saucepan combine 1 cup fresh cranberries and 1/2 cup light-color corn syrup. Cook and stir over medium heat 4 to 5 minutes or until berries begin to pop. Remove from heat; stir in 1/2 cup cranberry sauce or relish. Cool. Makes 1-1/2 cups topping. 1. For ganache: In a small saucepan, heat whipping cream over medium-high heat just until boiling. Remove from heat. Add the 8 ounces milk chocolate (do not stir). Let stand for 5 minutes. Stir until smooth. Transfer to a large bowl. Cover and chill. 2. Preheat oven to 350 degrees F. Coat two 9x1-1/2-inch round cake pans with nonstick spray for baking; set aside. Prepare brownie batter according to package directions. Divide batter between prepared pans. Bake about 25 minutes or until edges are set. Cool in pans on wire racks for 10 minutes. Remove uncut brownies from pans. Transfer to a wire rack. Cool completely. 3. Preheat oven to 350 degrees F. In a large bowl, combine cream cheese, sugar, and vanilla; beat with an electric mixer on medium speed until combined. Beat in eggs just until combined. Transfer half of the mixture (about 1-1/2 cups) to a medium bowl. To one bowl, add the 3 ounces melted milk chocolate; stir until smooth. To the other bowl, add the melted white chocolate; stir until smooth. 4. Wrap heavy-duty foil around the bottom of an 8-inch springform pan, making sure foil comes at least 1 inch up the side. Using a sharp knife, trim edges from brownie rounds, making two 8-inch rounds. * Place one of the brownie rounds in the pan. Pour milk chocolate-cream cheese mixture on top. Place the remaining brownie round on the milk chocolate-cream cheese mixture and pour white chocolate-cream cheese mixture on top. 5. Place the foil-wrapped springform pan in a large roasting pan; pour enough hot water around the springform pan to come halfway up the side. Bake for 60 to 65 minutes or until cheesecake appears set when gently shaken. Carefully remove springform pan from water. 6. Cool in springform pan on a wire rack for 15 minutes. Using a small sharp knife, loosen the edge from the side of the pan; cool for 30 minutes more. Remove the side of the pan; cool completely on wire rack. Cover and chill overnight. 7. Remove ganache from refrigerator. Beat with an electric mixer on medium speed until light, fluffy, and of spreading consistency. Spoon whipped ganache into a pastry bag fitted with a medium star or round tip. Pipe stars or mounds to cover the entire top of the chilled cheesecake. Makes 12-16 servings. *Test Kitchen Tip: Before wrapping the springform pan in foil, place the bottom of the pan on each brownie round and use the tip of a sharp knife to trace around the pan bottom. Trim edges. This will assure the brownie rounds fit tightly in the pan. 1. Preheat the oven to 350 degrees F. For crust, in a medium bowl combine melted butter and 1/4 cup sugar. Add crushed crackers; toss to mix well. Press mixture onto the bottom and about 1-1/2 inches up the side of a 9-inch springform pan. Bake in the preheated oven for 10 minutes. Cool on a wire rack. 2. In a small saucepan bring whipping cream just to boiling over medium-high heat. Remove from heat; add chocolate (do not stir). Let stand 5 minutes. Stir until smooth. Pour chocolate mixture evenly over the bottom of the crust. Sprinkle with 1 cup pecans, if desired. 3. For filling, in a medium mixing bowl, beat cream cheese and sugar with an electric mixer on medium speed until combined. Add eggs, beating on low speed just until combined (do not overbeat). Pour over chocolate pecan layer in pan. 4. Bake for 30 to 35 minutes or until center appears nearly set when gently shaken. Cool cheesecake in pan on a wire rack for 15 minutes. Loosenand remove from side of springform pan; cool completely on wire rack. Cover and chill in refrigerator for at least 4 hours. 5. Let cheesecake stand at room temperature for 20 minutes before serving. 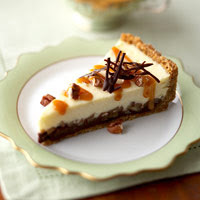 Garnish each serving with a drizzle of caramel ice cream topping, and, if desired, additional pecans and Chocolate Garnish. Makes 12 servings. Chocolate Garnish: Line a baking sheet with foil; set aside. In a small saucepan heat 1 ounce of chopped semisweet baking chocolate over low heat until it melts. 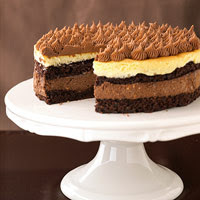 Drizzle chocolate over the prepared baking sheet in a crisscross pattern. Chill, uncovered, until firm. Carefully break chocolate mixture into 2-inch pieces. Advance Preparation: Prepare recipe as directed. Transfer to an airtight container; cover. Freeze up to 1 month. Before serving, thaw frozen cheese cake in the refrigerator for 24 hours. Garnish as directed. 1. Preheat oven to 350 degrees F. Lightly grease the bottom of a 9-inch springform pan. Wrap a double layer of foil around the bottom and side of pan to form a watertight seal; set aside. For crust: In a medium bowl, stir together crushed gingersnaps and the 2 tablespoons granulated sugar. Stir in melted butter. Press mixture onto the bottom of the foil-wrapped pan. Bake about 14 minutes or until crust starts to brown. Cool on a wire rack. 2. In a very large bowl, beat cream cheese with an electric mixer on medium speed until fluffy. Add brown sugar and flour; beat until smooth. Add eggs and egg yolks one at a time, beating after each addition just until combined. Beat in vanilla. Pour over crust, spreading evenly. Place the foil-wrapped springform pan in a roasting pan. Pour enough hot water into roasting pan to reach halfway up side of springform pan. 3. Bake about 1 1/4 hours or until a 2-inch area around the outside edge appears set and the center appears nearly set when gently shaken. Remove springform pan from water. Cool in pan on wire rack for 15 minutes. Using a small sharp knife, loosen edge of cheesecake from side of pan; cool completely (about 1 3/4 hours). Remove foil. Cover and chill overnight. 4. Prepare Caramel Topping. Remove side of springform pan; transfer cheesecake to a serving plate. 5. Spoon topping onto cheesecake, spreading to cover top. Garnish with chopped English toffee. Cover loosely and chill for 2 to 6 hours. 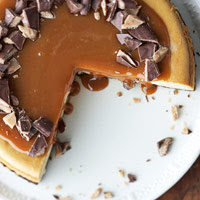 *Caramel Topping: In a large saucepan, combine 1 1/2 cups granulated sugar, 1/4 cup water, and 1/2 teaspoon lemon juice. Cook over medium heat, stirring to dissolve sugar. Bring to boiling; reduce heat. Without stirring, boil gently, uncovered, for 9 to 12 minutes or until mixture turns a deep amber color, occasionally swirling pan and brushing down the side with a wet pastry brush. Add 1 cup whipping cream (mixture will bubble); reduce heat to medium-low. Simmer, uncovered, for 12 to 15 minutes or until reduced to 1 1/3 cups, stirring occasionally. Chill about 30 minutes or until thickened but still pourable. My favorite time of year is here!! Fall! With Halloween, Thanksgiving and Christmas just around the corner here something to make every ones life a little easier. 1. Preheat oven to 350 degrees. Prepare cupcake pan with liners or cooking spray. 2. 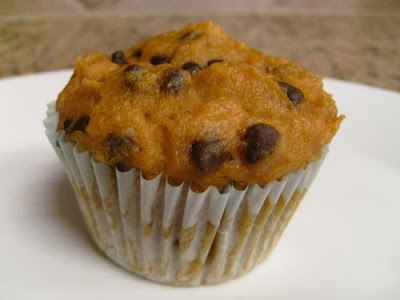 Combine cake mix, pumpkin, and water until well blended. 4. Fill each cupcake liner 2/3 full with mix. Mix ingredients well and spread at the bottom of a 9x13 glass baking dish. Bake for 20 minutes at 375 degrees. Let cool. Growing up my mom would make this dish at least every couple of weeks, if not once a week. Our family loved it! She would always serve with fresh salad and garlic bread. YUM! In a large pot filled about 3/4 the way with water cook lasagna noodles. In a large skillet brown hamburger and then stir in onions and sautee. Stir in spaghetti sauce, olives and mushrooms. In a medium size bowl mix cottage cheese, sour cream, and egg. In a 9x13 glass baking dish layer the sauce mix on the bottom followed by 3 noodles and then the cottage cheese mixture. Repeat this 2 more times. Layer the top with cheeses and additional olives and mushrooms. Bake at 350 degrees for 50 minutes. Serve with salad, garlic bread, and/or any other side dish your heart desires! My kids really like this one too! It can be "tweeked" to fit you're own tastes! Cut chicken into bite size pieces and cook through. Add all ingredients together except for the cheese. Pat out a croissant to make it alittle bit bigger. Place a dab of mixture onto the center, then add some mozzarella cheese on top of that. Fold the edges in, lastly being the long end, and it will look like this (kinda like a diaper). Place on a greased pan and bake according to the croissant package and golden brown.